To explore the relationship between demographics and internet usage, we estimated a weighted, mixed-effects logit model with random intercepts by country and robust standard errors using the Stata program gllamm for estimating generalized linear latent and mixed models. Alongside this pooled model, we evaluated the robustness of the results by estimating the models for each country separately. These country-specific models yielded similar conclusions. Overall, we find that computer ownership has a strong positive influence on individual internet use. A person with a working computer in their household has a predicted probability of using the internet of 0.77 on a scale from 0 to 1, or 77%. A person without a computer has a predicted internet use of 0.35 (35%) – a difference of 0.42, or 42 percentage points. 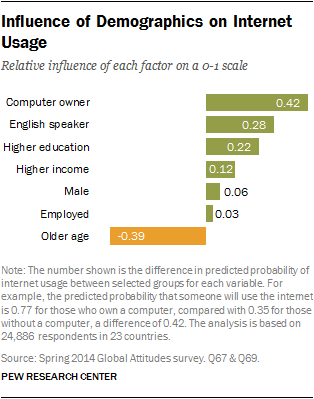 In addition to computer ownership, English language ability (+0.28), having a secondary education or higher (+0.22), having a higher income (+0.12), being a man (+0.06) and employed (+0.03) all have a statistically significant, positive impact on internet use. Age also has a significant influence on internet use, controlling for other demographics. Older people have a lower level of internet use than their younger counterparts. For example, the probability that a 26-year-old will use the internet is 0.59 or 59%, compared with a 50-year-old who has a predicted probability of internet use of .20 (20%) for a difference of 39 percentage points (-0.39). The dependent variable is internet use, a dichotomous variable where 1 indicates the respondent uses the internet and 0 means they do not use the internet. Internet use consists of individuals who state that they use the internet at least occasionally or say they own a smartphone. The independent or predictor variables for education, gender, employment, computer ownership, English language ability and income were recoded as dummy variables, where 1 means secondary education or higher, female, employed, owns a computer, English language capable and income at or above the approximate country median. English language ability includes respondents who state that they can either speak or read some English and those who took the survey in English. Age is treated as a continuous variable, ranging from 18 to 97. All independent variables are significant at the p < .05 level.